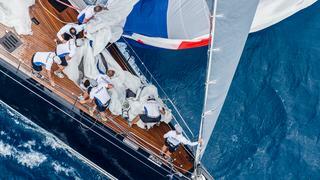 As the yachts went in to day three of the Loro Piana Caribbean Superyacht Regatta 2016 there was everything still to play for - especially in Class A where racing machines Nilaya and Inoui were both in contention to take the trophy. Despite Freya dominating Class D throughout the regatta, its rivals weren't deterred going into the final day. Here Wild Horses and 30 metre Southern Wind Blues get a little too close for comfort as they vie for the lead. Despite Freya dominating Class D throughout the regatta, its rivals weren't deterred going into the final day. Here Wild Horses and 30 metre Southern WindBlues get a little too close for comfort as they vie for the lead. Eschewing the intricate designs and eye-catching colours of its opposers for clean lines and a gleaming white hull, 46 metre Vitters Unfurled is unquestionably beautiful as she thunders around the final course. Eschewing the intricate designs and eye-catching colours of its opposers for clean lines and a gleaming white hull, 46 metre VittersUnfurled is unquestionably beautiful as she thunders around the final course. Having overcome huge obstacles including a broken engine and burst sail, Nilaya ultimately came out on top at the Loro Piana Caribbean Superyacht Regatta & Rendezvous 2016. Her efficient, expert and stunningly synchronised crew - who gave it their all through every day of racing - are undoubtedly a big part of the reason why. As the regatta comes to a close it is views like this that the owners and crew will treasure. 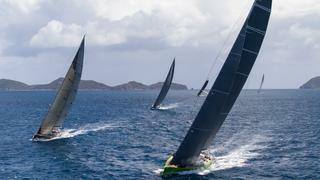 The opportunity to see such an incredible fleet of sailing superyachts give it everything they've got in the gorgeous surroundings of the British Virgin Islands is what keeps the best racing yachts in world coming back year after year. One of the reasons so many owners, crew and enthusiasts enjoy regattas is because of the rare experience of seeing so many beautiful yachts on the water at once. This image, with brilliant aft views of Atalante and Nilaya, is just a small taste of the incredible viewing on offer at this year's Loro Piana Caribbean Superyacht Regatta & Rendezvous. 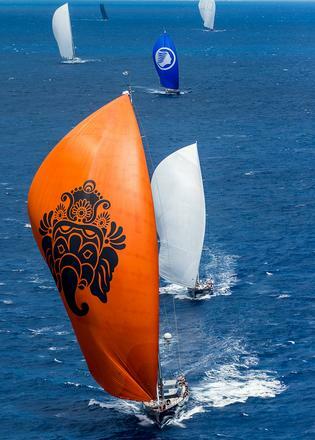 It was a battle of beautiful spinnakers as Elfje and Ganesha drew up side by side during day two of racing. Whether you prefer Elfje's royal blue fairy or Ganesha's orange elephant, there's no denying they look spectacular. While it's true that regattas use handicap and classing systems to create exciting racing, another reason so many love them is that they are a great leveller when it comes to getting yachts out on the water. 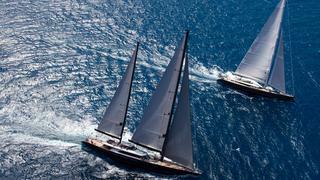 Here 60 metre Perini Navi Seahawk and 49 metre Fitzroy Ohana go head to head in a test of skill over size. While it's true that regattas use handicap and classing systems to create exciting racing, another reason so many love them is that they are a great leveller when it comes to getting yachts out on the water. 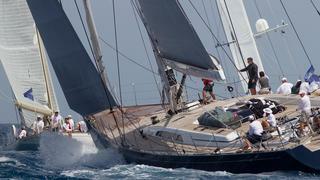 Here 60 metre Perini NaviSeahawk and 49 metre FitzroyOhana go head to head in a test of skill over size. Streamlined hulls, sharp sails and expert technique - this is the quintessential image explaining why superyachts offer some of the best and most impressive sailing on the water. Of course it could be argued that no-one enjoys regatta racing quite as much as the captains, tacticians and crew that put hours of hard work in to it. From this image of a Seahawk crew member enjoying the view from the bow and signalling to the team behind him while waves crash onto the deck, it's easy to see why it appeals to so many. 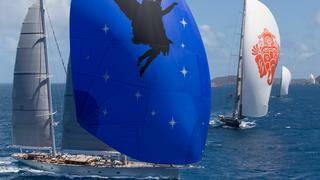 The Loro Piana Caribbean Superyacht Regatta & Rendezvous 2016 kicked off in style on March 10 with 21 sailing yachts battling it out during fine weather in the British Virgin Islands. Of course, fine weather for a sailing yacht means plenty of wind resulting in dramatic waves for the team on board 44.4 metre Samurai to contend with. 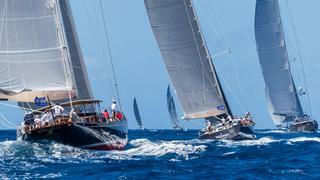 With so many yachts signed up, competitors were split into four classes with start times staggered to create a day of safe but exciting racing. Led by the 67 metre Baltic Hetairos, this momentary line-up was a sight to behold. With so many yachts signed up, competitors were split into four classes with start times staggered to create a day of safe but exciting racing. Led by the 67 metre BalticHetairos, this momentary line-up was a sight to behold. 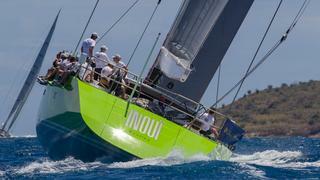 With its bright green hull, Marco Vögele's 33.4 metre Vitters Inouï is hard to miss on the race track. Catching the Caribbean sun this divisive yacht made a good case for brightly coloured paint jobs. With its bright green hull, Marco Vögele's 33.4 metre VittersInouï is hard to miss on the race track. Catching the Caribbean sun this divisive yacht made a good case for brightly coloured paint jobs. Part of the joy of owning a sailing yacht is putting your stamp on the design with a top superyacht spinnaker. 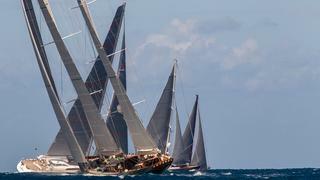 Inspired by the god that gives it its name, 46 metre Vitters Ganesha leads the pack in this classic regatta photo. 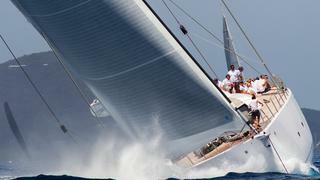 Part of the joy of owning a sailing yacht is putting your stamp on the design with a top superyacht spinnaker. 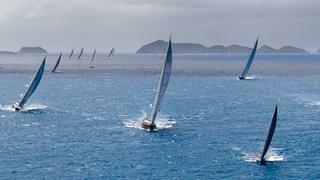 Inspired by the god that gives it its name, 46 metre VittersGanesha leads the pack in this classic regatta photo. Something that often surprises many regatta newcomers is just how far these sailing behemoths heel towards the water to gain speed. This amazing superyacht aft view of Samurai is the perfect example. 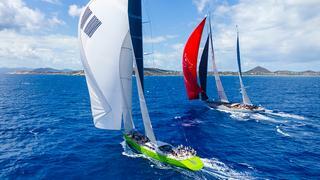 Of course the real thrill of yacht racing is in, well, the racing. Neck and neck on a long stretch of open water, Inouï and 52 metre Royal Huisman Elfje show why the sport is just as much about skill and tactics as design and size. 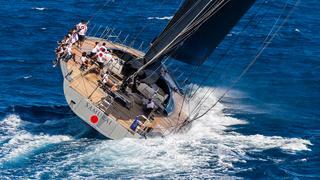 Of course the real thrill of yacht racing is in, well, the racing. Neck and neck on a long stretch of open water, Inouï and 52 metre Royal HuismanElfje show why the sport is just as much about skill and tactics as design and size.